Spring energy and green saving tip #3, Take a room-by-room tour of ENERGY STAR @home and learn what you can do this spring to save energy, save money and help protect our environment in your own home. I don't know about your neck of the woods, but here n Florida things are really starting to heat up. Even though I keep the AC on 78 degrees during the day, it runs a lot. We did put in a new HVAC (heating ventilation & air-conditioning) system a couple of years ago and we have definitely felt a more comfortable home and seen about a 30% cost savings. Still, if you are looking for easy do it yourself (DIY) ways to save energy and cash this spring and throughout the year, I have a few green tips you will love. Considering that the average household spends $1900 a year on energy costs, I think we all can use some easy tips to spring into energy savings and save some green, right? Check your air filters every month - A dirty filter wastes your money and energy. Especially during heavy usage months like summer, be sure to change your air filter every month if it looks dirty. At a minimum, change the filter every 3 months. Dirty filters slow down air flow and make your system work harder to keep you cool. A clean filter prevents dust and dirt from building up in the system helping to prevent expensive maintenance and early system failure. 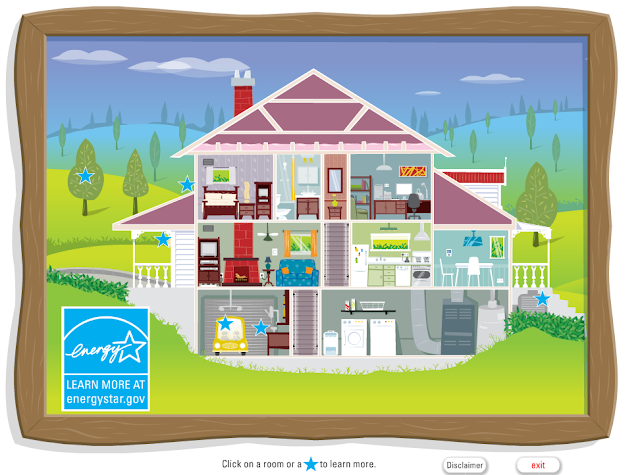 Take a room-by-room tour of ENERGY STAR @home - I really love this tool provided by the US Environmental Protection Agency (EPA) to easily help homeowners learn what to do this spring and beyond, in every room in our home, to save energy, save money and help protect our environment. What tips can you share to help us cut our energy use and save?